Last week I introduced the graffiti wall to the kids. It's an idea I grabbed from pinterest. 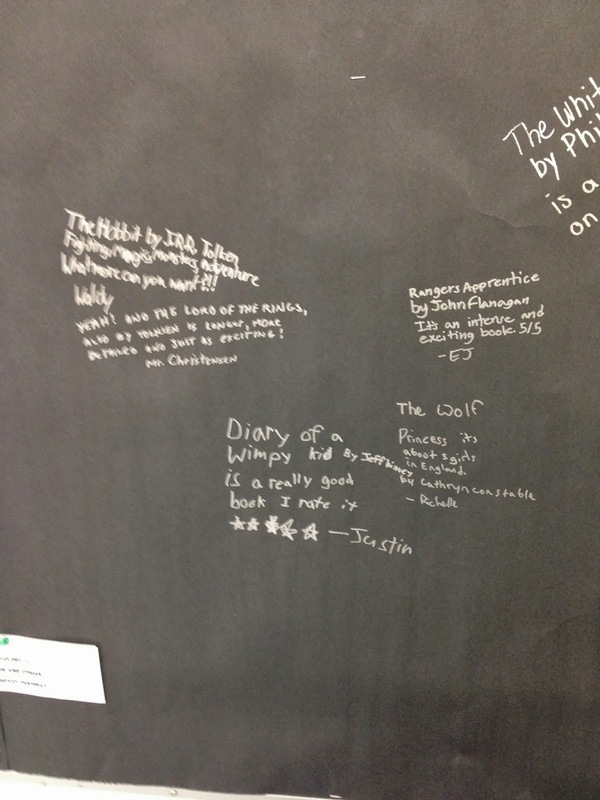 Basically I encourage the students to write small reviews about books they've enjoyed so that others can get quick ideas of what to read. I started it off and several of my grade 5s have joined in. On this Pro D day we had the pleasure of having Birchland and Coquitlam River visit our school. During our break they did a tour of our school to see what we have implemented for self-regulation. My classroom was visited and I was overjoyed to share how I have changed my classroom! One issue I currently have is that I can't fit a zen den into my room. 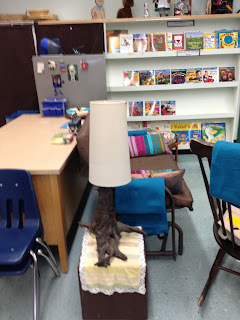 I do have a secluded cloakroom but I share it with a K/1 class. 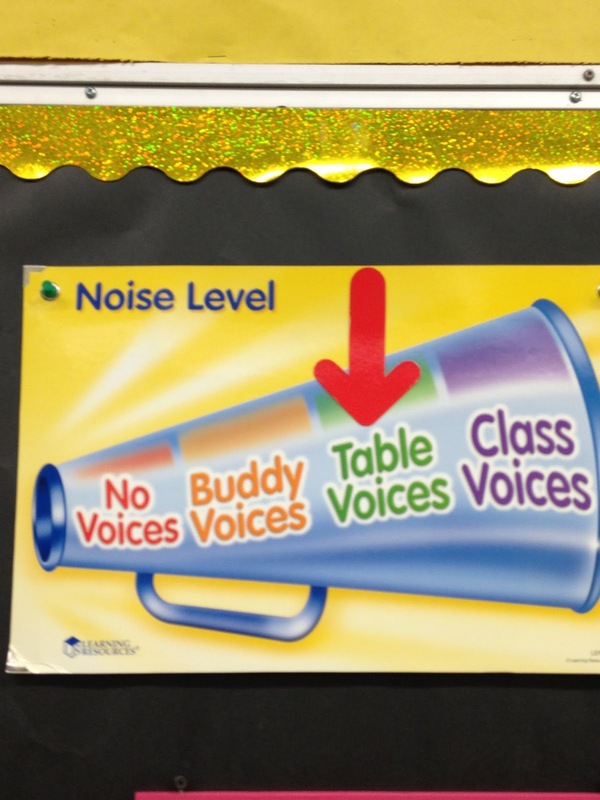 So how do I help students who need a quiet place to go? So far I've used the intermediate collab room at the end of the hallway, or the hallway itself. I don't mind that students go way down the hallway because they are (in my opinion) responsible enough to handle it. What is the purpose of Pro D Day? Sometimes when I meet "non-teachers" I am asked what the deal is with all our pro-d days? Is it a day off? Why are my kids at home? Why are there so many? The history of ProD days are that teachers negotiated 6 extra days into the school year in order to use 6 days during the year for professional development. On these days we go to workshops and learn ideas that will be helpful in our classrooms. It benefits your kids. So why don't I take them all before school starts, in August? I have no idea what the needs of my class will be in August. I need to meet the kids and find out the challenges in order to decide what I need to learn. I suite my Pro D to fit the kids in my classroom. So having 6 spread out days allows me to re-visit a topic at various times in the year and see what I have done that works, and what I need to do. There is extra Pro D after school and many teachers do that. But if you were given the chance to learn more to do better at your job, wouldn't you bargain it in to your contract? And that is why we have Pro D days. For our first week of school we do team building activities. One of our main things is self-regulation. 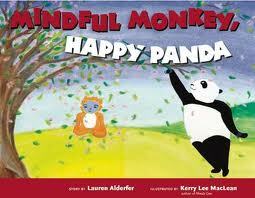 A great book for this is Mindful Monkey, Happy Panda. All about a Monkey who doesn't concentrate on what he's doing, when he's doing it! Then Panda teaches him how to be mindful and think about what you are doing and enjoy it. Live in the moment! Great lesson for students AND TEACHERS! 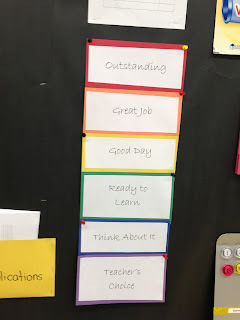 Job postings in the classroom. 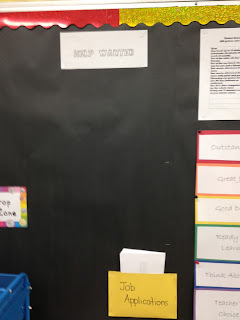 Students were very excited today to find the "Help Wanted" section in my classroom. I had 11 jobs posted. As soon as the kids had free time they were over at the wall filling out job applications! I filled most jobs in a few minutes. A few are still on the wall. The kids are excited to work hard (they cleaned in under 5 minutes) and earn their salary for the week. If I find jobs not done I will not pay. Several of the students expressed an interest in pooling their salaries together to get big prizes from my chart. However, I may have to jack up prices if it's too easy to get! I teach intermediate but my colleagues have jumped aboard the design wagon as well! They have been working on self-regulation and the environments they have created for their students are quite inspiring. First up in Vicki Duncan's K/1 classroom. 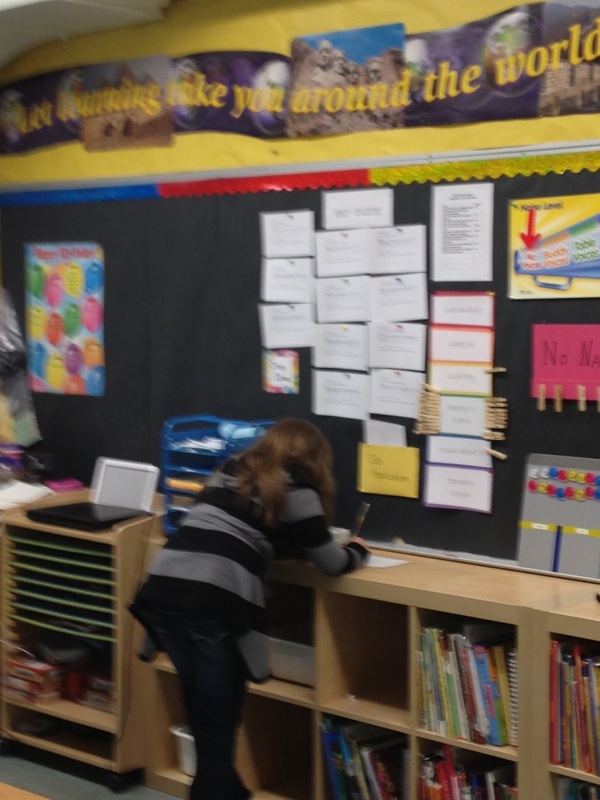 Vicki has a double classroom because she shares one side with all the primaries. Hanna Miskiman teaches K/1 as well. She has brought in an outdoor touch to her room. Using fabric to hide books and teacher items you don't want to see! 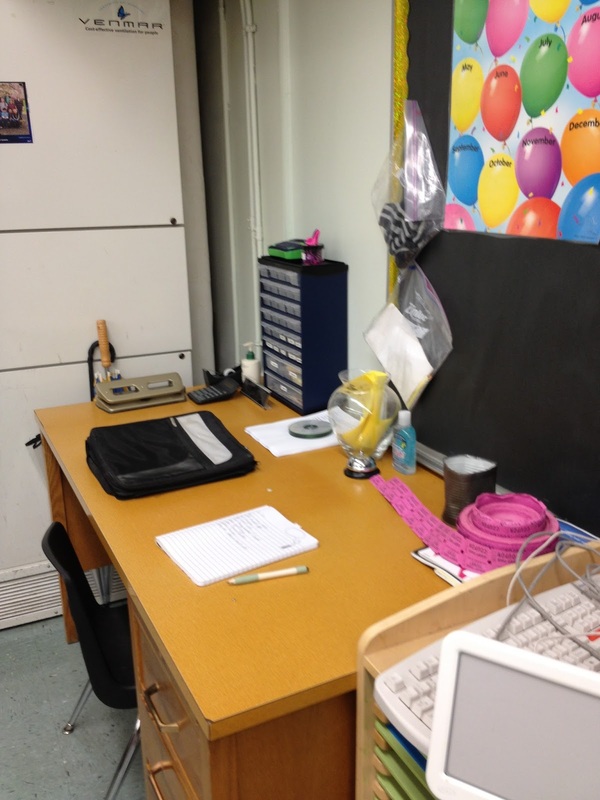 Stefanie Lynch teaches K/1 Montessori and has a very orderly classroom. Wonder station, which has books and items for the theme when school starts. This is our library. Priscilla Maki has purchased some circus tents and pillows to make it a great quiet reading zone. 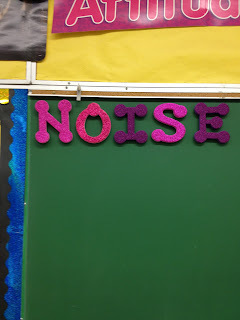 With the help of Pinterest, my classroom design has really taken a turn towards more student independence. The following are some pictures taken this year from just before school start. To store little things I use daily I purchased a tool storage box at Canadian Tire. I made sure to get one with multi size drawers. So far I have filed my usual supplies away and I'll add to it as needed. This is the drop zone. 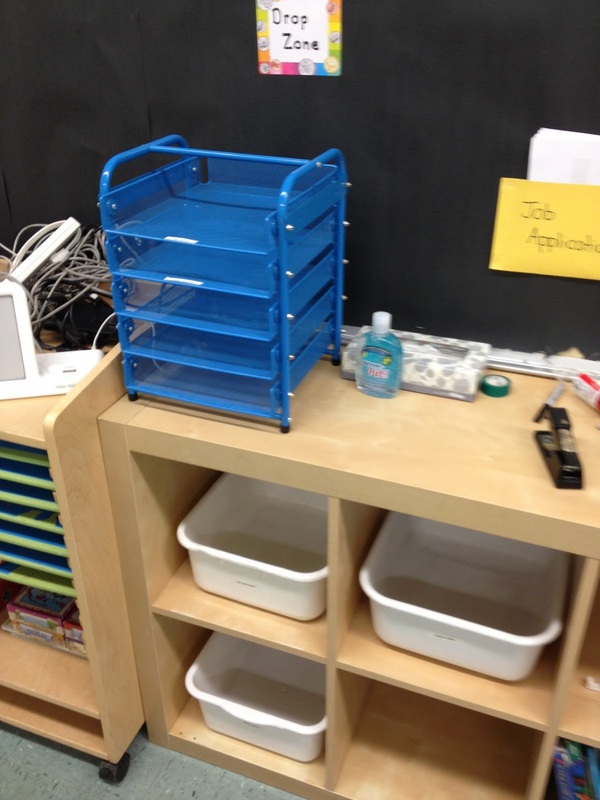 Students can drop off forms/notes for me in the top blue tray. They also can get extra notices in the 2nd tray. Below there are bins for lost and found, library books, and work to be handed in. I have also stocked the area with a tissue box and hand sanitizer. New this year, a Help Wanted chart. I made job postings and job applications. Students will apply for classroom jobs they like. Each job has a salary based on tickets I give out. Students get paid on Friday. They can purchase special treats in class such as using a special chair, or choosing the game in gym class. I will also have a bank ledger for students who want to store their money. 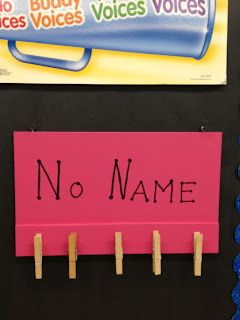 Behaviour Chart: This has clothespins on it with each students name. The pins move up and down during the day based on behaviour. 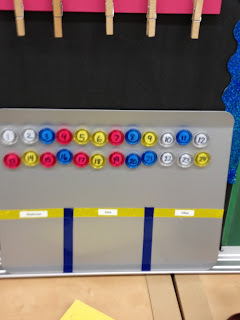 Since I number my students this magnet chart works well for bathroom, drinks and office trips. Students simply move their magnet to the right place. Now I know where they are and it frees up my white board. No name? No problem. Just pin the work up and have them find it later. No need for a bin or magnets. What is the noise expectation? Easy to see now. I found these foam letters at Michaels. Attached a magnet or two. 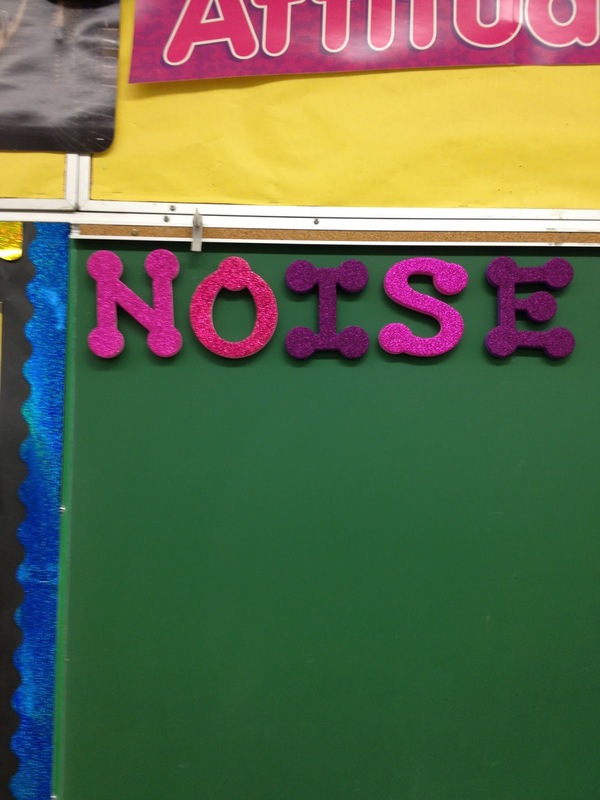 Now when the class is too noisy I put one letter up as a reminder. If I spell Noise...then silence begins! Moved my picture books to a new location. I also store the book hospital here. I also have a deli system in my classroom. Students take a number when they need help. That way I don't get a line up at my desk and students get my undivided attention. Clipboard holder from Really Good Stuff. Also storing extra supplies. Great idea from Pinterest, pom pom glued onto dry erase markers make a quick and easy eraser! 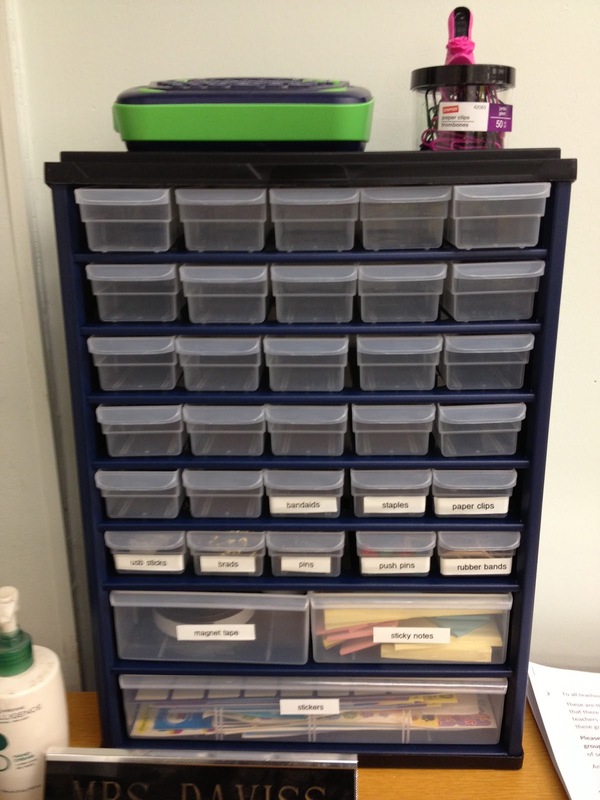 Students store all their supplies in their own cubby. I moved them to the front this year because it has more space than the previous location. The shout out box allows students to write nice notes for each other. 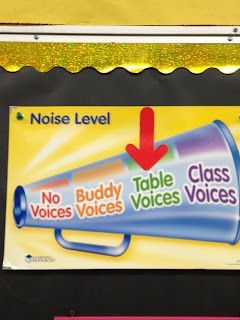 The following are views around the classroom. I teach grade 4/5 Montessori in a public school setting. I'm married and have two kitties.